Here’s the sign on Vermont Road (near W. Wyomissing Avenue) showing the location of the trout nursery ponds. 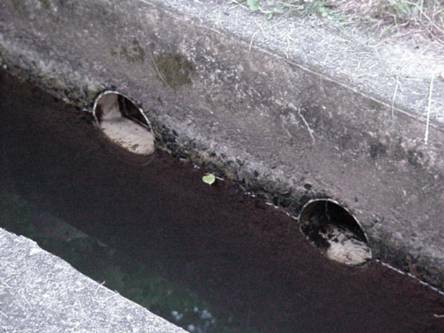 The supply water for the ponds enters these pvc pipes located in the wall of the dam. At the end of the dam is a spillway which allows overflow water back into the creek. Below the dam are the ponds. The pond is basically a concrete tank. There are three ponds connected in series for a total length of 108′. The first two ponds are 42′ in length and the last pond is 24′ in length. Under the first screen grate (in the foreground) you can see the white pvc pipe supplying water to the ponds. 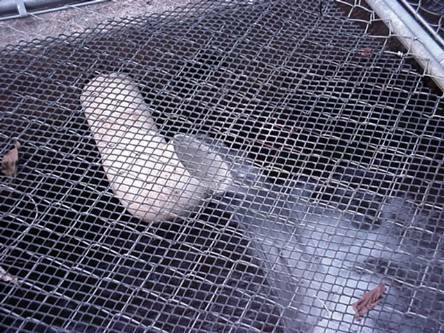 The grates protect the fish from natural predators. Here’s a close-up view of the water supply coming from the dam. 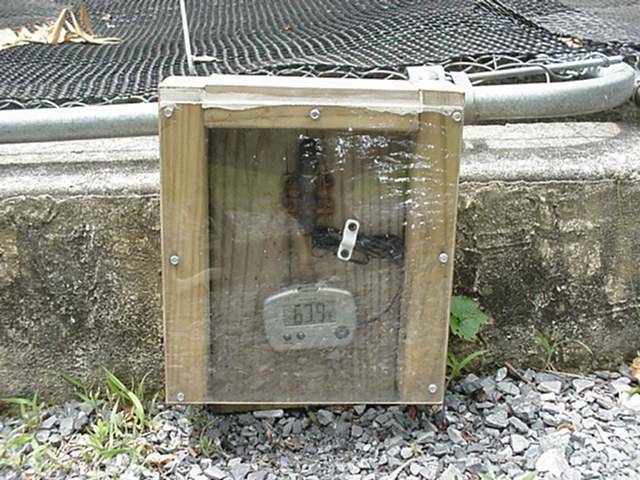 A digital thermometer with the bulb located in the fish pond water helps keep track of the pond’s water temperature. 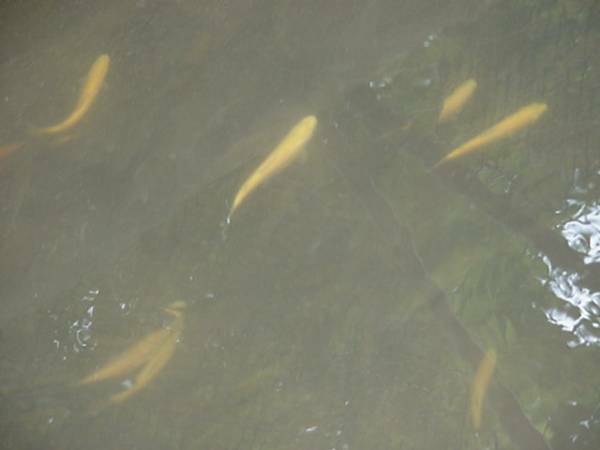 Here’s a view of the trout swimming in the pond. 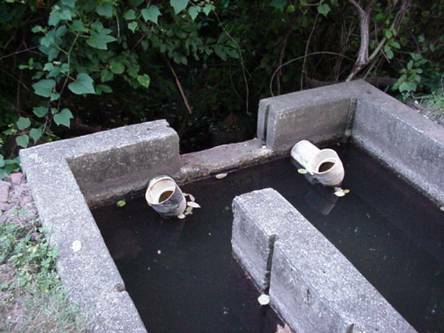 Located in the last pond is the water outlet. The outlet water is piped back to the creek. 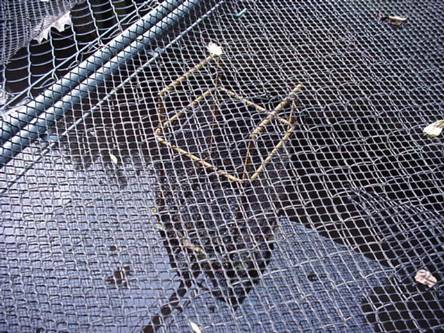 The outlet is covered with this mesh basket to prevent the trout from escaping the pond. The pond water from the last tank is piped back to the creek. Early in the history of the Association the need to sponsor activities relating to the interests of fishermen were realized. 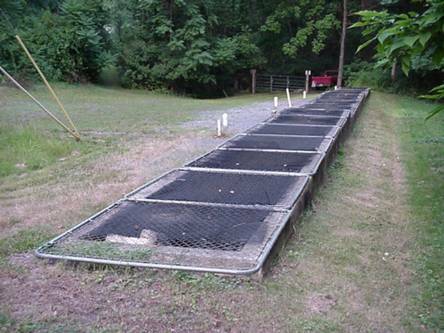 Fish purchased or donated from various sources were stocked in local dams and streams. In June of 1945, C. Elmer Bender, then President of the Association, attempted to restore a fish rearing pond on the property, but full success of the project was never realized. Mr. Bender never gave up on the fish rearing program, and over a period of time various sites for a pond were suggested and considered. It was not until July 14, 1955, that an agreement was negotiated with Mr. Bender to establish two trout rearing ponds on property he had then recently acquired near the club lands. Through the efforts of a devoted group of club members, excavation and placing of railroad ties to establish the rearing ponds brought success to the project. In August of 1962, the Association purchased the ponds from Mr. Bender’s estate. 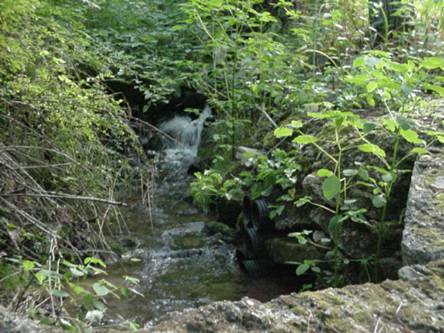 It is for this reason the ponds are named in his honor and a memorial plaque is displayed on-site. Various improvements to the ponds have taken place in recent years. 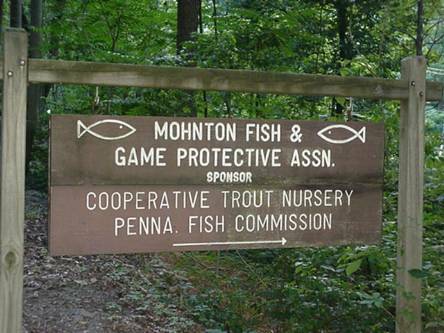 Mohnton Fish and Game stocks trout in the Angelica Creek, Porky Pond, and Wyomissing Creek during the spring. If you would like to help with the fish stocking please contact the club.